I've posted before about how our booktalking programs have exploded this year. We're now in the schools more than ever before and I'm LOVING it! Booktalking is truly one of my favorite things to do and I'm so glad to have the chance to do it more! I have not been posting about my specific booktalking programs, in part because I've been super busy, but also because most of the books I'm sharing are Newbery-eligible and due to confidentiality guidelines, I don't feel right posting about them. But last week, I realized that almost all the titles I had brought to one school were not eligible, so I wanted to share with you how my booktalking program typically goes! This particular visit was to 3 fourth grade classes at one of our local elementary schools. They combined all three classes in one room, so I only needed to do the presentation once. Some schools prefer to have us visit each classroom individually, which we are happy to do. Usually if we're doing multiple presentations, I try to send two people together so one person doesn't have to talk for 45+ minutes straight. When Is a Planet Not a Planet? 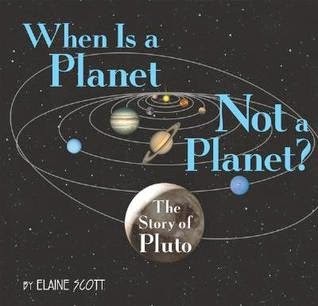 : The Story of Pluto by Elaine Scott (Clarion Books, 2007). This is a book about Pluto, but it's also a book about how scientists find out information about space and the fact that scientists can be WRONG. In fact, scientists have been wrong lots of times, all throughout history! When I booktalk this book, I emphasize to kids that when I was their age, when their teacher was their age, Pluto was a planet! We were taught that there were nine planets in the solar system. We had never even heard of a dwarf planet! This gets lot of nods from teachers. At the end, I let them know that scientists are always finding out new information. Who knows what they'll discover next? And I bet there are some future scientists in this room, so who knows what one of YOU might discover next? 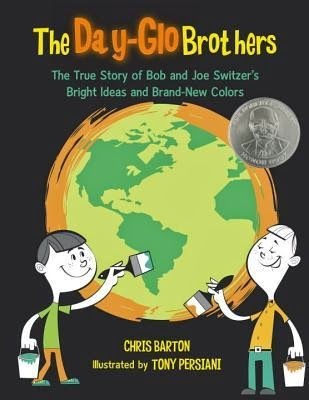 The Day-Glo Brothers: The True Story of Bob and Joe Switzer's Bright Ideas and Brand New Colors by Chris Barton (Charlesbridge, 2009). This picture book biography features two brothers who invented new colors. I tell the kids that one of my favorite kind of books is a book that tells me about something I never even thought to wonder about - just like this book! I read the first two spreads and talk a little bit about what Day-Glo colors are - usually several kids are wearing Day-Glo colors, so I can point that out. And I show them one of my favorite things about this book - the illustrations start out black & white in the beginning and as Bob & Joe begin experimenting, more and more color is added in until they have their breakthrough and I show them the spread that's entirely in Day-Glo colors. 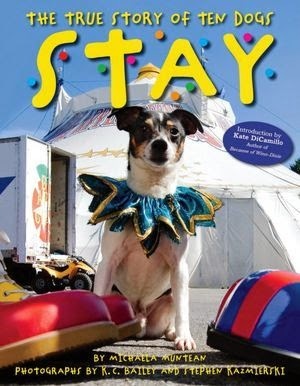 Stay: The True Story of Ten Dogs by Michaela Muntean (Scholastic, 2012). 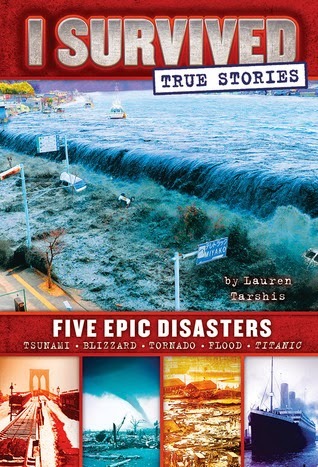 Titanic: Voices from the Disaster by Deborah Hopkinson (Scholastic, 2012). The Titanic is always a familiar subject to kids. It fascinates them! 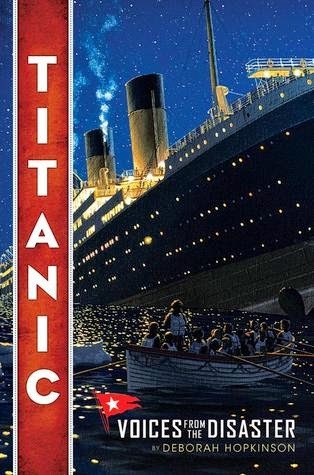 Some may have seen the movie, some may have read other books about The Titanic, but this book is different from any book I've ever read about The Titanic. Deborah Hopkinson uses real survivors' accounts to bring this story to life. Reading this book is like sailing on the ship alongside them. There are plenty of facts and anecdotes to share to entice kids to read this book, but I read a part from the beginning where Jenny, the ship's cat, decides to take her kittens off the ship, "one by one down the gangplank" before it sets sail from Southampton. It always gives me chills! Here's another easy sell, particularly if you have fans of the I Survived series in your midst (chances are you do). While the I Survived books are fictional, here we get five true stories from actual survivors of disasters. When I booktalked this one, I mentioned the Children's Blizzard, the Boston Molasses Flood, and the Henryville tornado (which happened just a few miles from here in 2012!). This is a great pick for kids who love action and adventure stories or who are interested in learning about real disasters. When my staff and I go booktalk, we always bring bookmarks with all the book covers, titles, and authors so that the kids can remember what book they heard about that sounded good. A lot of times, kids will bring these bookmarks in to the library. We keep extras at our desk, so if they didn't bring theirs with them, they can easily say "I have a bookmark like that!" and we'll know they're from a booktalking class. We keep a record of what everyone's booktalking in our Evernote account, organized by school and grade, so it's really easy to look up what books a kid might have heard about at their school. If we're doing a longer program with more than 5-6 books, we'll make a book list handout for the kids. And we always give these to the teachers, too! I think our teachers enjoy and benefit from the booktalks just as much (sometimes more!) than the kids.